What’s the Cook Library Staff Reading This Month? Hey, do you want to know what the library staff is reading? Then you are in luck! Since we are a bunch of bookworms, we like to share what we read every month on the Cook web site. You can find the June lists on our Books/Movies/Music page. 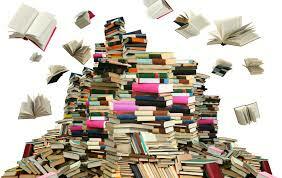 The books are separated by Fiction, Mysteries and Suspense, Nonfiction, and Biography/History. Here are some books that caught my eye, among the many listed. Silva, Silva and more Silva: If you notice several Daniel Silva books showing up on the Mysteries and Suspense list, that’s because the Fiction Department staff was reading Silva for its monthly genre study. We all enjoyed Silva’s work and recommend his books if you like page-turning, well-written thrillers. Visiting Author: Andrea and Ellen snagged pre-pubs of Annie Barrows’ new book, The Truth According to Us and really enjoyed it. Barrows, who co-wrote The Guernsey Literary and Potato Peel Pie Society and the Ivy + Bean children’s series, will speak at Cook Library at 7 p.m. June 16 about her new book, which comes out June 9. There still is time to register. For Sci Fi and Fantasy Buffs: The Library at Mount Char by Scott Hawkins got a thumbs up from Mark and Lindsay, who say it will appeal to Neil Gaiman and Joe Hill fans. The Queen of the Tearling received rave reviews from Connie and Andrea. Chick Lit and Women’s Lit: In the mood for a beach read? Chris says to pick up The Knockoff: A Novel by Lucy Sykes and Jo Piazza. And Jane likes How to Start a Fire by Lisa Lutz. Teenage Brains and the Chicago Mob: The nonfiction title list varies widely. Rob read a book called The Teenage Brain: A Neuroscientist’s Survival Guide to Raising Adolescents and Young Adults by Frances E. Jensen with Amy Ellis Nutt. Thomas recommends a book about the mob called When Corruption Was King: How I Helped the Mob Rule Chicago, Then Brought the Outfit Down by Robert Cooley. Joan Rivers and the Civil War: The Biography/History section also runs the gamut. If you want a little bit of Hollywood, For a fun, light read, recommend Melissa Rivers’ tribute to her famous mother in The Book of Joan: Tales of Mirth, Mischief and Manipulation. For history buffs, Thomas is reading a book about the South after the Civil War called The Fall of the House of Dixie: The Civil War and the Social Revolution That Transformed the South by Bruce Levine. And this is just scratching the surface of what we are reading. If none of these titles float your boat, come in and see us at the Reference Desk for more ideas!